UPDATE 9/10/17: An anonymous commenter has informed us that the store closed a few days ago. No surprise there! Yes, the Dalewoods Shopping Center contains both a Best Market (gourmet warehouse) and an Hmart (Korean superstore). 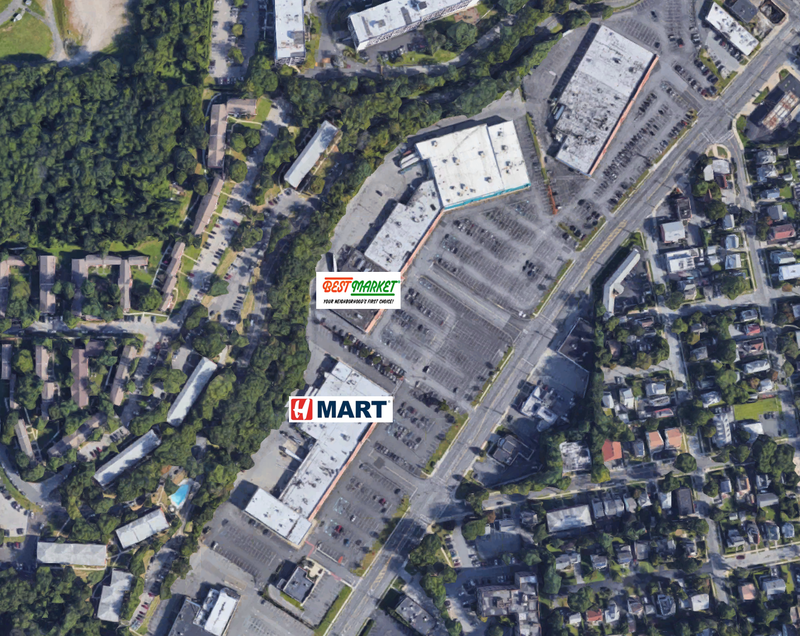 The Hmart is a former Pathmark and will unfortunately not be covered on this blog, due to the fact that the store was CRAZY busy! I couldn't even get one good picture inside, and forget about my idea of eating lunch in the food court. Best Market was...empty. Best Market is also significantly smaller than Hmart. And despite the fact that Hmart has a Korean focus, this location also had a large organic produce selection, a deli, a bakery, and plenty of American and Latin groceries. Best Market is stuck with lower turnover, higher prices, and more vanilla product offerings...bad combination. You enter to a large produce department with multiple long aisles of single-tier produce bins. There was way too much space all around here. And notice how many shoppers are in the picture above! The service departments are along the back wall. I like the floor, ceiling, and decor, but I'm not a fan of pretty much everything else! Seafood department with a large empty space. Not a good sign. Yes, the aisles are wide, which is very nice! However, so are the spaces on some of the shelves. Dairy is in the last aisle. Again, I really like the graphics and the colors, but the products are just too mainstream for the prices and the presentation that they use. There is a maybe closed juice bar in the front corner. Hmart had lines at every register going into the grocery aisles, and they were getting people out very quickly. I've always thought that Best Market was an overpriced and mediocre store -- there's nothing wrong with it but there are certainly better choices around. While this new store is beautiful, I'd really like to see either lower prices around or really unique products. The Hartsdale Best Market closed down a couple of days ago. You wrote this post just in time; it can now be read as an apt obituary. Oh man. Thanks for the info! I can't say I'm surprised. I'll post an update right now.